Once a solar system is installed and commissioned you will start to generate your own electricity. This electricity is fed to your fuse board ready for you to use. From here, your return on investment is given via the three following outcomes. The FIT is money paid to you for per kWh for generating electricity. You will be paid the FIT for 100% of the energy you generate by your electricity supplier for 20 years (index linked). Full details below. All the electricity that you generate may not be used. When you are out of the home for instance, the electricity will be returned to the grid. For this you will be paid an export tariff. Full details below. When your system is generating and there is a demand for electricity in the home you will always use the electricity you are generating before the electricity you have to buy from your supplier. Full details below. All the electricity generated by your system will run through a generation meter before anything else happens to it. This meter looks very similar to the incoming electricity meter in your home or business. Each unit of electricity will be recorded on the meter, and is records in kilowatt hours (kWh). You will be paid the feed in tariff for 100% of the energy you generate, irrespective of whether you use the electricity or not. The rate at which you will be paid for each unit is set at the outset of your feed in tariff application. This then lasts for 20 years and increases in line with RPI each year. When your installer commissions your system they will give you a certificate of registration. You will then apply for the Feed in Tariff with your electricity supplier. After which you will read the generation meter once a quarter and provide them with a reading either by telephone or online. All the electricity that you generate may not be used. When you are out of the home for instance, the electricity will be returned to the grid. For this you will be paid an export tariff. 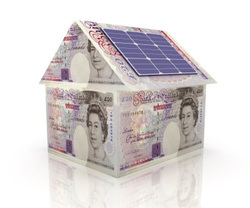 This is in addition to the Feed in Tariff which is paid on 100% of the units you generate. Unless you have a large system of 30kWp or more (This is about 120 solar panels) you will currently receive a “deemed” export tariff. This is because your supplier currently can’t tell what portion of the generated electricity has been used in the home and what has been sent back to the grid. They will estimate this as 50% of the total units you generate, and make a further export payment over and above the feed in tariff you receive. Lastly then there is an opportunity to make savings on the cost of the electricity you purchase. When your system is generating and there is a demand for electricity in the home you will always use the electricity you are generating before the electricity you have to buy from your supplier. The amount you will save doing this is more unquantifiable as each household will have a different consumption profile. For the purposes of illustration to you we are duty bound by our regulator the MCS to estimate this as 50%. This therefore assumes that 50% of your generated electricity will be used in the home and the rest will be returned to the grid. Of course this is an estimate and it will vary from home to home. We recommend that to make best use of your own electricity you adopt some slight usage changes, maybe setting the dishwasher to come on in the middle of the day rather than at night. Other customers have chosen to install a smart switch to heat hot water during period where the demand otherwise for electricity is low.